This one comes from my friend Jen, who was my worldly friend in graduate school in Wyoming. She’d lived in California, New Jersey, and points in between. She was once my traveling companion, taking me along to her university visit in Utah on a snowy and icy Interstate 80, as well as showing me the sights of New York City (she’s the one who first taught me how to hail a cab and allowed me the immense pleasure of doing so in Brooklyn on the Fourth of July after watching the fireworks at Lady Liberty from across the river). Going through the storehouse, I hadn’t realized how many postcards she’d sent me in her travels to Dodger Stadium, Cedar Rapids, the New Jersey Turnpike, and Amsterdam. 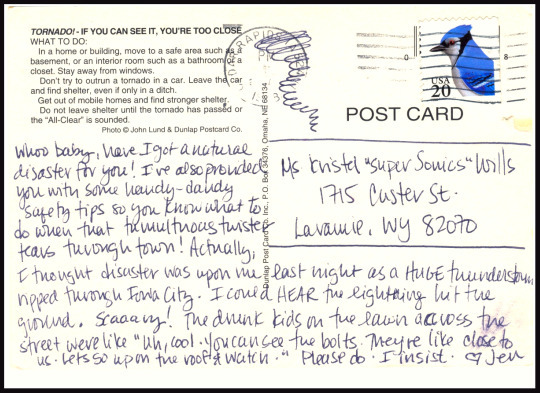 She ended up getting her PhD in Iowa, where she sent me the postcard that could end up saving my life, and maybe yours too, one day, with the helpful tips on what to do if there’s a tornado heading toward your door. If there is, please get off the computer. And run. WHAT TO DO: In a home or building, move to a safe area such as a basement, or an interior room such as a bathroom or a closet. Stay away from windows. Don’t try to outrun a tornado in a car. Leave the car and find shelter, even if only in a ditch. Get out of mobile homes and find stronger shelter. 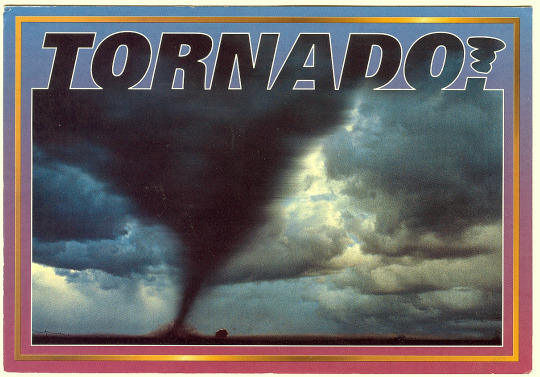 Do not leave shelter until the tornado has passed or the “All-Clear” is sounded.